The installers were neat, polite and professional. They even helped my wife clean a hard to reach window and demonstrated their work for a local college class. The bid was spot on and the office was responsive and very professional. We are thrilled with our new 36-panel solar array installed recently by Dan Brandborg and his great team at SBS Solar. This highly skilled and experienced group was great to work with from start to finish, and we most highly recommend this company to anyone wanting to utilize clean solar energy for their home or business. Dan and his team were always available to answer our questions, the project went smoothly, and we are now producing clean electricity for us and even others to use. Thank you SBS Solar for everything you did. 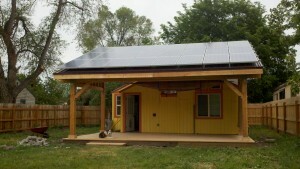 SBS Solar completed our 11.2kW Solar PV system on our home up Rock Creek in the fall of 2010. It is comprised of 52 Sharp 216 modules and Enphase M190 microinverters. We are pleased to report that the system has produced 23.2 Megawatt hours since it was installed in the fall of 2010. In order to accommodate our flat roof and the arced shape of our home, SBS Solar built a custom ballast mounting structure for the racking. They employed 3D modeling to strategically place all the modules around the roof to avoid shading throughout the year. SBS Solar did have to replace one faulty microinverter, which they found while monitoring our system using the enlightened website. 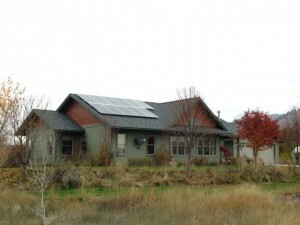 Their team, with very little down time, replaced the inverter quickly and efficiently. We are pleased with the work SBS Solar completed on our home, and their attention to details during the design, installation and monitoring stages. 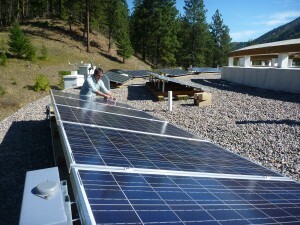 We would recommend them for larger solar projects on home or business. Wisdom Ranger Station Solar Electric System Dillon Montana. 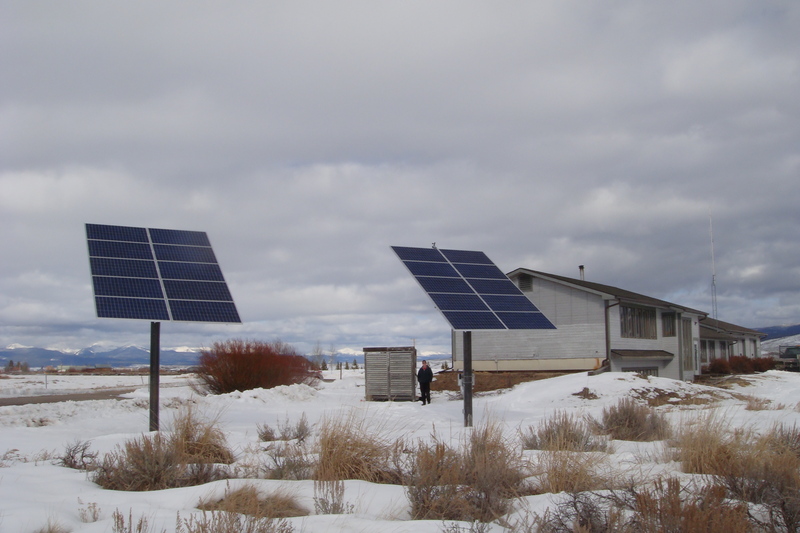 Sustainable Building Systems, LLC recently completed the installation of 4 kW, grid-tied PV systems at three of our District Ranger Stations. Two of the systems were roof-mounted arrays and the third system had pole mounted arrays. The project was “turn-key” and included all necessary components and work for complete and operational systems. I have been very satisfied with all aspects of this project. Sustainable Building System’s project proposal was detailed and thorough. All components that they proposed met our specifications. Their personnel were highly qualified, professional, and very good to work with. They did a good job of communicating with me as well as the local staffs at each of the Ranger Stations. They also did a good job of coordinating with their subcontractors and the utility companies serving the sites. The workmanship by Sustainable Building Systems and their subcontractors was done in a quality manner with little oversight by the Forest Service. The project was completed on-time without any change orders and within the original contract amount. Based on my experience with Sustainable Building Systems on this project, I would welcome the opportunity to work with them again. 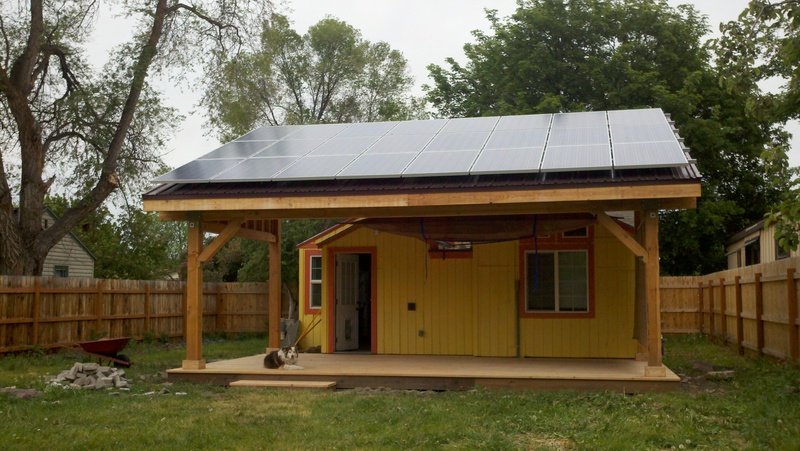 I’m writing to share my great experience with your company and my 100% solar-powered home. In the fall of 2011, SBS installed a 24 panel, 6 kW, grid-tied solar PV system at my home in central Missoula. Because my house had additions, I don’t have one flat surface for the panels, so SBS hired subcontractors to design and install a covered back porch structure for the panels. I started producing all of my own power in the early spring and now in the summer am producing 50% morepower than I need. I will receive a credit for this extra power and it will mitigatethe power use in December or January when I might be producing as little as 30%of own my power. I recently installed more efficient appliances, and thus I will probably produce more power than I use this year. 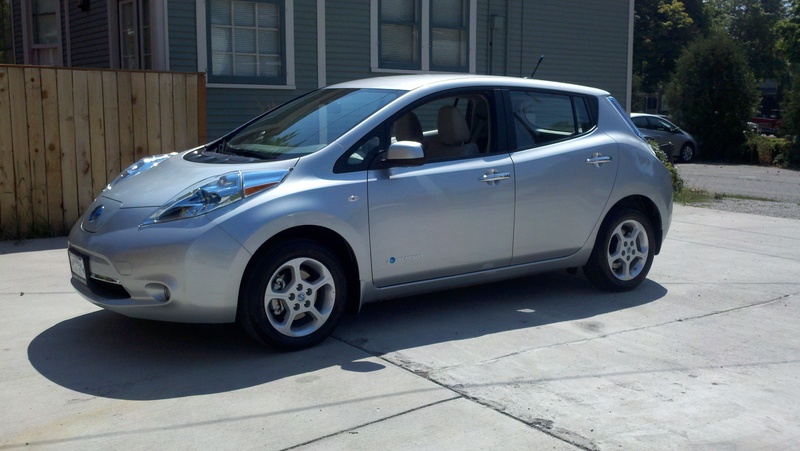 This surplus of power led me to decide to lease a 100% electric car, which will be 100% solar-powered car for at least 6 or 8 months out of the year. I felt compelled to act because we can’t afford to ignore the signs of climate change or the role we play in it. I feel a moral obligation to reduce my carbon footprint, to protect biodiversity and protect the planet for future generations. 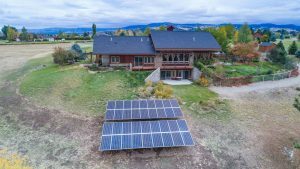 Can you imagine the reduction of coal and oil consumption we could achieve if every family in Western Montana had a solar-powered home and solar-powered electric car? Maybe mega-loads, tar sands mining, and Otter Creek coal mining would all become unnecessary. The technology is available and ready for this now in Western Montana. So essentially, the solar system had a net cost of less than $14,000 for 100% annual power. Thank you for the important work you are doing.